Today I have a guest post from my good friend Lynn who is also a local artisan. After knowing Lynn for a number of years now, I have watched her make and create. Actually, whenever I am with her, she is always making or thinking about her newest project. She makes handmade wool products and you can see more of her wares on her shop, Lynn’s Lids. 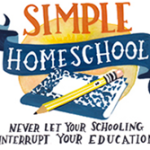 A techie before becoming a full-time homeschooling mom, I spent my 20s and most of my 30s not involved in creative endeavours (other than programming, which is creative, but not B2B programming). Then I picked up knitting in late 2008 and after making a few scarves for my family, I decided I would try a felted hat for myself. I figured if I could keep myself in hats, I’d save a bunch of money. Friends started asking for hats, and slowly Lynn’s Lids was born. I also got into needle felting, which I love to teach. 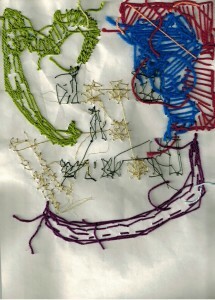 Now I create with wool wherever I go and have recently started carrying a sketchbook with me for inspired moments. My life is mostly centred around my home and family. We eat food prepared from scratch, so there is creativity in the kitchen. This year I have taken my eldest to a local cafe and gallery with our sketchbooks in hand to try to emulate or be inspired by the artist of the month whose work covers the walls while we enjoy a treat together. Here we are at a the local café, my eldest with his sketchbook and me working on a bespoke jellyfish toque. I love custom orders. It is so much fun working with other people’s ideas and passions and illustrating them (on a hat, iPad sleeve, or tea/coffee cozy). When I am creatively stuck, I hit the books in the library, I hit the gallery cafés with my son, I hit the internet, I meditate, I do zentangles, I get out to the woods or the beach, I ask friends and family for ideas or about their passions, I take my camera and go for a walk, I search out galleries or films and just try to soak it all in. Sometimes I just pick up a personal knitting project and forget about it. Let someone else lead for a bit. The emotions associated with being in a creative rut? I suppose ennui and perhaps frustration. However all is forgotten once the creative juices get flowing again. These came from being bored of making the same 2 ornaments. I took a ball and thought, “What could I make from a ball?” As it turns out, you can make a lot of different things with a wool ball. When I was a child I went to a day camp where we could choose our activities. I remember really enjoying the magic of the darkroom and the pottery wheel. I still enjoy photography and a couple of years ago my brother gave me back my first little pottery wheel project. That warped little bowl is where I keep my wristwatch at night. I keep my watch in the warped little bowl I made on the pottery wheel as a child at Seneca Day Camp. @clayshapes this one's for you! My creative process for designing new patterns actually involves a lot of math and some guesswork. Failures are a part of the process, but I feel good about the fact that my failures can usually be used in some other capacity (my first attempt at a cadet cap was trimmed down to be our tea cosy for several years, pillbox hat attempts that were too small have become bowls, etc). It’s nice to see less failed attempts as time goes on and the guesswork is brought to a minimum by experience. I think creating a new pattern from something I’ve seen or been inspired by is totally thrilling. From my imagination to my fingers. Don’t be hindered by… well, anything. Creativity is beyond constraints. Dream it, feel it, try it. I love zentangle. In fact I wish I’d known about it when I was going through cancer treatment as it has gotten me through a few tense moments. One of those brought this beautiful piece about. Three families had just gone through some struggles with our kids and we just needed to get past it and enjoy our evening. So I pulled out a piece of paper, a fineliner, and a green marker and started one section of the zentangle and passed it onto the adult next to me and just said, “Fill a section with a pattern.” He did, and passed it on until we adults had filled it. We all felt better. Sometimes you just need to #zentangle. This was a collaboration of 5 adults that I just couldn't throw away after. Take a small piece of note paper and divide it into a few sections by letting your pen roam and loop here and there over the paper. Then start to fill each section with a different repetitive pattern. That’s it. Try it! 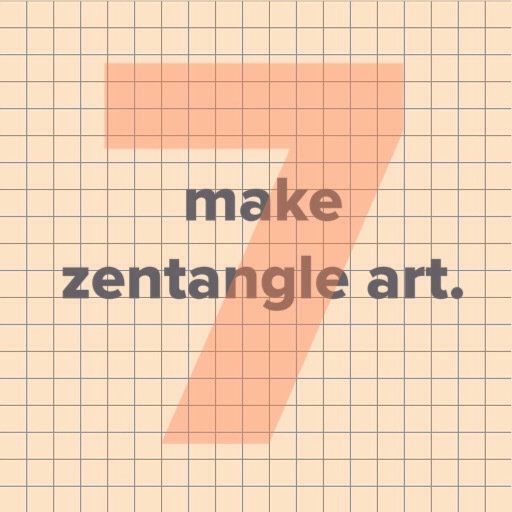 Learn more about what zentangle is and see a bunch of examples on Instagram, flickr, or Pinterest. Lynn’s Lids can be found on the web, Etsy, Facebook, Twitter, Instagram, WordPress, and Pinterest. Let those curves and straight lines flow. Get lost in repetition and pattern. Thanks Lynn for sharing your story and a prompt! Tomorrow, I will have a recap of my first week of mayBE 2015 and share some of my experiences and my own challenges. Thanks so much for the opportunity to share my story here, Rozanne. And especially for this challenge, which the boys and I are really enjoying! Thank YOU Lynn. It’s been a pleasure all these years watching your handmade business grow. You’ve made our family more conscious about supporting local artisans and always looking for “handmade with love” options. And I am so thrilled and grateful for my kids to be surrounded by such creative people in their life! Lynn, you are always such an inspiration to me. Whenever we are out and I see you walking, talking and knitting I do a face palm because my knitting is forlornly waiting at home! Right back at you, Brooke and Rozanne. I feel so fortunate to have met both of you amazing creative moms. You are both creative, parenting, and lifestyle inspirations for me. Lynn, there are no words for you and your art. You make the winter much prettier and that’s amazing! Awww… Falon, I just read this – thanks so much! That’s one heck of a compliment after the past 2 long, chilly winters! Next post: mayBE 2015: eight. Previous post: mayBE 2015: six.